Please welcome Peng Sheperd to The Qwillery, as part of the 2018 Debut Author Challenge Interviews. 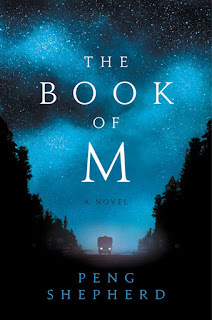 The Book of M is published on June 5th by William Morrow. Peng: It was a picture book about a spider! A Very Friendly Spider was the title. I was just old enough to read, and I drew the accompanying illustrations as well, of course. My mother, wanting to encourage my interest in books, got it laminated and bound with a cheap plastic spiral spine, and gave it back to me as a surprise. Being only four or five, I gleefully assumed that my book had been published. If only it were that easy! Peng: I’m a hybrid. I almost always start by pantsing it and make a huge mess because I’m too excited by the newness of the idea to plan anything. If I’m still obsessed with the story after 50 pages of exploration, then I come up with an ending, which is the make or break moment. If I can get the ending, then I make a brief outline and everything (mostly) falls into place from there. Peng: Revision! It’s such a different (but very necessary) skill from first drafting. Peng: Ursula K Le Guin has always been and will probably always be my biggest source of inspiration. Her books were life-changing for me, and were a huge part of the reason that I began, and kept, writing myself. I also have been greatly influenced by the speculative fiction of Margaret Atwood, China Miéville, NK Jemisin, Lev Grossman, and Jeff Vandermeer. I love reading their work because they write things so imaginative and unique that it seems like it could never work, but they do it so courageously and brilliantly that each time I turn the page, I can feel the boundaries of what I had thought possible in writing expand. TQ: Describe The Book of M in 140 characters or less. Peng: Disappearing shadows, magical elephants, sinister cults, a dangerous journey, a mysterious city. TQ: Tell us something about The Book of M that is not found in the book description. Peng: Ory and Max are the main characters, but the novel is actually told from 4 points of view—there are two other characters not mentioned on the back of the book who play very significant roles in the story and whose fates are deeply tied to those of Ory and Max. TQ: What inspired you to write The Book of M? What appeals to you about writing about a near future catastrophic world? Peng: I love post-apocalyptic stories in general. I’m a big fan of The Stand, Station Eleven, The Passage, The Walking Dead, and video games like the Fallout series, The Last of Us, Shadow of the Colossus, Legend of Zelda: Breath of the Wild, Horizon Zero Dawn, etc. I’m fascinated by the idea of a world wiped clean, but even more than that, about what that new reality would do to the survivors—if living in it would force you to become more true to yourself, or less. I think The Book of M asks that question a lot of its characters… maybe in even more direct ways than some of its bookshelf-mates, because people are fighting to literally not forget who they are and who they love. TQ: What sort of research did you do for The Book of M? Peng: Most of my research was centered around Zero Shadow Day (which is a real-life phenomenon that occurs every year! ), as well as several ancient myths in the Rigveda, as they’re both subjects that feature prominently in the mystery surrounding the vanishing shadows. And I studied a lot of highway maps. A lot. 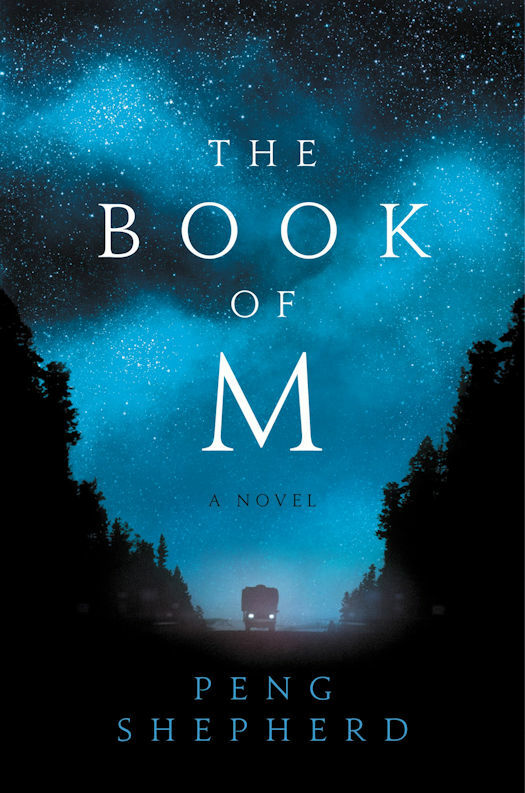 TQ: Please tell us about the cover for The Book of M? Peng: The amazingly talented Ploy Siripant at William Morrow designed and created the gorgeous cover. It does depict something from the novel—I can’t say much more without spoiling it, but a big portion of the story follows some of the characters as they set out on a very perilous trip from one place to another. TQ: In The Book of M who was the easiest character to write and why? The hardest and why? Peng: The easiest and hardest character to write turned out to be the same one. I’ll refer to him as “the amnesiac.” He was there from the start, but went through many incarnations—a disgraced psychiatrist, then a con man, then a mathematician, then a mayor... it was like pulling teeth! Something just felt off about him every time, but I didn’t know what. I even finished the near-final revision of the novel with him still not set. It wasn’t until the very last few weeks before the book went out on submission that I suddenly realized who he really should be and how to fix him. I wrote all of his chapters again from scratch in a matter of days, and he took on a life of his own that I never could have imagined. TQ: Which question about The Book of M do you wish someone would ask? Ask it and answer it! Peng: It’s not exactly a question I wish someone would ask, but the thing I had to cut from the story that I miss most was a group of talking crows that followed some of the characters around and periodically interrupted their conversations to give advice. It didn’t move the plot forward in any way and the book was already so large, I just couldn’t justify keeping it. But I loved those cheeky little crows! TQ: Give us one or two of your favorite non-spoilery quotes from The Book of M.
Peng: I’m in my “make a huge mess” pantser phase of a second novel. It’s still very early days so I’m hesitant to reveal too much, but let’s just say that it’s another mystery, but set in our present day world. There’s no apocalypse this time—all the cities are fully inhabited and everyone’s got a shadow—but there’s still plenty of intrigue, danger, enigmatic figures from shady organizations, and a little bit of impossible. Peng: Thank you so much for having me!